The Multiple Myeloma Research Foundation (MMRF) is a non-profit organization formed to raise awareness and funding for myeloma research. Mitchell’s father, Randy, a partner at Dagger, Johnston, Miller, Ogilvie & Hampson, LLP, was diagnosed with multiple myeloma in September 2008. He has seen every form of treatment in the past 9 ½ years for this form of blood cancer. Mitchell Happeney climbed Mt. Kilimanjaro in Kenya in February 2017 with the MMRF Moving Mountains group and raised over $15,000.00 for research. The elder Happeney could not participate in that climb due to treatment and the higher elevation (19,341 ft.). The senior Happeney has not allowed the disease and the treatment to impact his professional career is echoed by his partners. 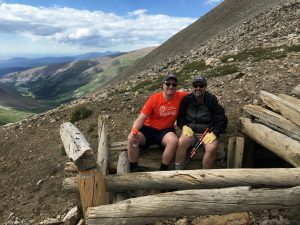 It is purely coincidental that in 1999 Happeney and his then 12-year-old son, Mitchell, tried to summit Mt. Democrat while in Colorado on a family vacation. They ran into 50 mph winds between peaks (Democrat and Lincoln) and were forced to retreat. “We hope to both summit this time,” said Randy Happeney. Contributions to the MMRF Moving Mountains fund can be made through the website at https://endurance.themmrf.org/2018Democrat/happeney. Download this News Release here .For more information about Dagger Law, please visit www.daggerlaw.com.